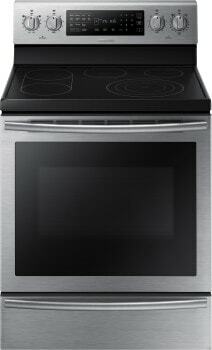 Samsung NE59J7650WS 30" Stainless Steel Electric Range 5.9 Cu. Ft.
5.9 cu. ft. Large Capacity The large interior can easily accommodate a big roast, multiple casserole dishes or several racks of cookies. True Convection Great for fast baking and broiling, heat is distributed thoroughly and food cooks evenly for tastier results each time. Steam Cleaning Use SteamQuick for a quick clean in 20 minutes, or use Self-Clean for a deeper clean. Flexibile Cooktop A specialized 5 burner cooktop ensures you have the flexibility to simultaneously cook multiple dishes using different-sized pans. Flexibile Cooktop For added convenience, the oval burner can be used for over-sized pots and pans. Warming Drawer Store just-cooked meals at optimal temperatures until they are ready to serve. Warming Drawer It also elevates oven capacity, making it easy to slide a large roast inside. Soft Close and Clean View Door Get a clean view of the oven and keep an eye on your food while it's cooking without opening the door. Soft Close and Clean View Door The Soft Close Door closes with a whisper rather than a bang.